The Yard is a very solid addition to my rotation of neighborhood drinking spots. Only 12 taps but they are all interesting and generally excellent--Chuck's 38 taps make 12 seem awfully limited though, but the atmosphere is a lot classier. Their food is way better than average Mexican--I usually just get a side order of beans--they are cheap and amazing and their jicama salad when they have it is excellent. The interior is well done but pretty dark--since they don't have brewery tap handles, you need to read their beer menu to see what their selections are---I have had to go outside to read the menu and have even had to bring a flashlight. They just finished expanding their inside seating--before that there were only a few tables inside. But the outside and the covered deck are still pretty comfy with the heaters going in the winter. This is a great place. 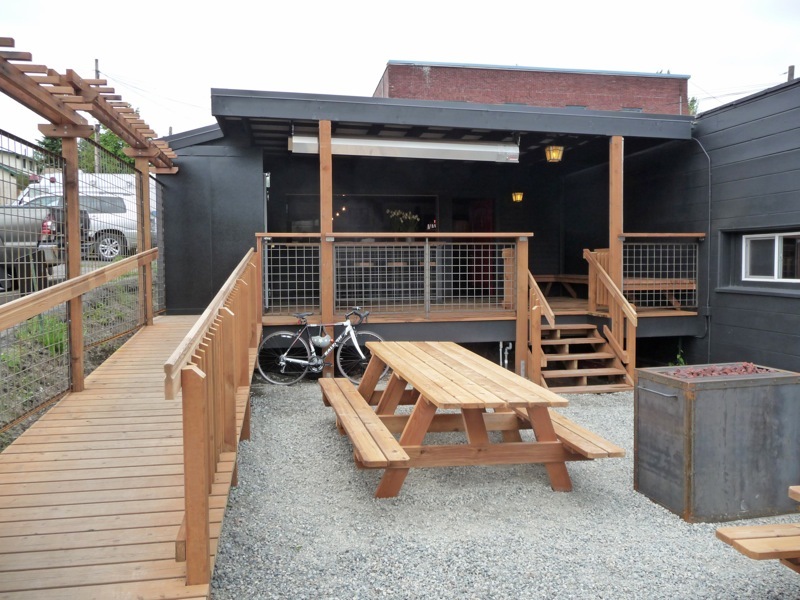 At the front of the aptly named Yard Cafe is a welcoming gravel-covered yard. A simple but unique wood and decorated metal fence and large iron gate separate the yard from the front sidewalk and the parking lot on the left. Eventually hops and other plants planted along the fence will screen out the street but these are just starting to grow now. Several picnic tables and a gas fire pit invite you to spend an afternoon outside with a beer and surprisingly good food. 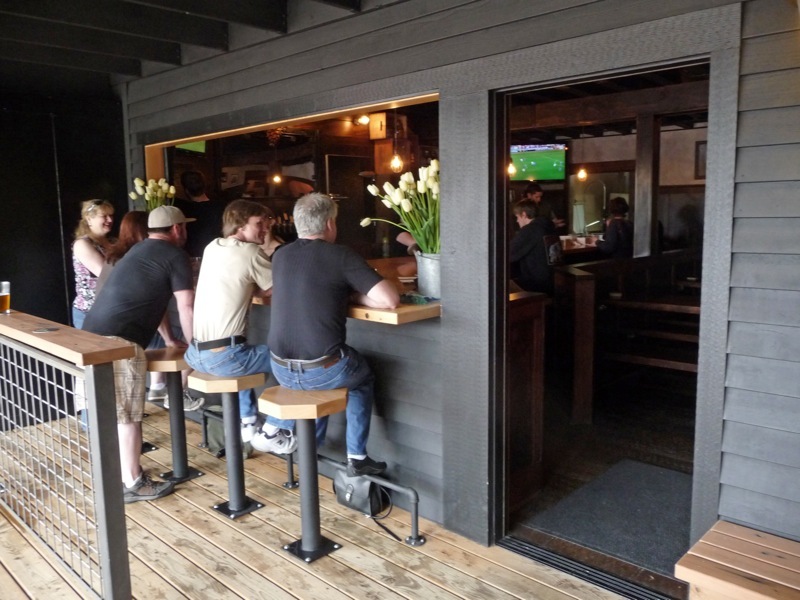 Beyond the yard is a covered raised deck with built-in wooden benches and stand-up beer counters and an outdoor heater (after all, this is Seattle!). Four fixed bar stools face inside along the outdoor bar, and when a sliding garage-door style window is open, give direct access to the bartenders and provide a half-indoors/half-outdoors feeling. Inside, black, wood of various tones, and steel dominate the look. The ceiling is black with exposed beams, and walls are mostly paneled with wood. 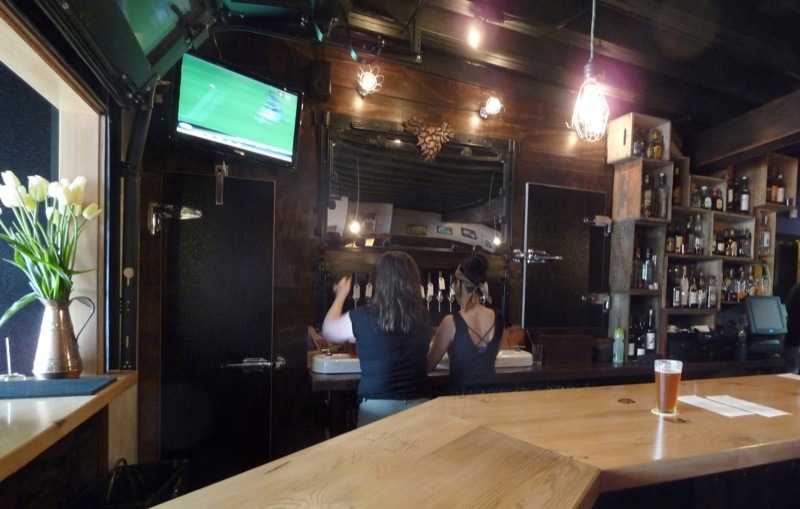 The same bar counter from the outside extends from the entrance to the back of the main room. Itâ€™s made from a beautiful thick and wide slab of light colored wood and has bar stools to match. Behind the bar is shelving for liquor bottles made from stacks of old wooden crates and a row of tap handles. Also, high up at either end, there are two flat-screen TVs, usually tuned to European soccer. There are twelve taps with a wide range of craft beers (and very short lines as the refrigerated area is right behind the tap handles). 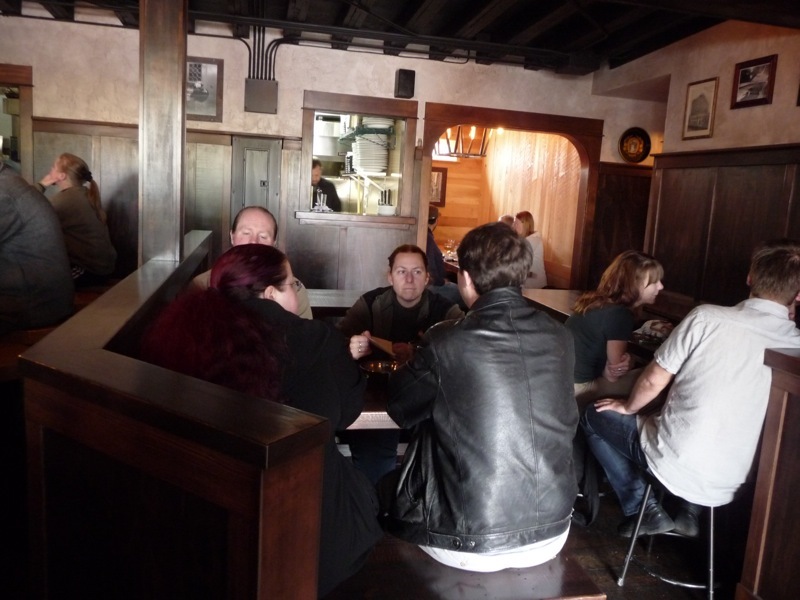 A good atmosphere prevails - conversations, good beer, and good food. The Mexican-style food is way above typical bar food; the tacos we tried were delicious as were the picante pickled vegetables.